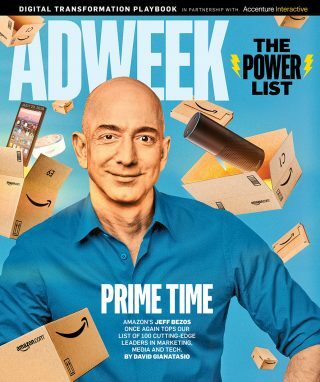 This year’s installment of The Power List, our fourth annual ranking of the top players across advertising, marketing, media and tech, sees Amazon’s Jeff Bezos return to the prime position, placing first for the second straight year. He outpaced Alphabet’s Larry Page (No. 2) and Facebook’s Mark Zuckerberg (No. 3)—though all three continue to drive us headlong into the future. It’s also worth noting that, for the first time, no holding company chiefs placed among the top 10, while honchos at consultancies, CRM firms, cloud providers and gaming concerns came on strong. To formulate the list, the editors considered numerous criteria. These included company value, revenue and growth, market performance, consumer reach, standing among rivals, industry accolades, media buzz and the amount of news each player contributes to the content cycle. As always, lesser known execs and divisional leaders share space with agency and media CEOs, brand chieftains and high-tech titans. It’s an eclectic mix, designed to reflect the dynamic, complex and interconnected streams of power that propel the Adweek universe. This story first appeared in the July 23, 2018, issue of Adweek magazine. Click here to subscribe.